An ab roller is a straightforward, uncomplicated piece of equipment that helps you work out abdominal muscles. Seeing ab wheel before and after pictures shows a significant trim of its users' waistlines. It is also known as an ab wheel or ab carver. This device uses a simple design, with two handles connected to a wheel. When it is used correctly, this training tool helps you build up a strong core, lats, and triceps. The ab roller has been around since the 70s. However, they have not been seen as a serious workout tool until only recently. Today's ab rollers are sleeker, more hi-tech, and durable. They are also marketed as leading to all sorts of impressive results for your body. However, many people still have questions about how to use ab roller and ab roller effectively. To determine this, we must look at how using an ab wheel affects your body. A lot of people ask, "Does the ab roller work?" The ab roller is fundamentally a device that targets abdominal muscles, including the oblique and rectus abdominis muscles. Its primary function is to enable you to do an advanced movement known as the Ab rollout exercise. Using the best ab roller also lets you take your body through a full range of motion that involves contracting and stretching your abs, as well as flexing the spine. This assortment of movements works out the rectus abdominis (which results in the classic six pack), and deep spinal stabilizer muscles like the transverse abdominis very intensely. It also engages side abdominal muscles, the lower and upper back, arms and shoulders, and latissimus dorsi muscles. This makes ab wheels a very effective tool for a more muscular and well-built core. It is possible to work out different parts of your body with the ab wheel depending on the angle you roll it out at. Regardless of the variation you use, it is important to keep your abs engaged and back straight throughout the exercise. This ab roller workout starts with you on your knees with the ab roller placed in front of your thighs. You then grip its handles and push the roller forward on an Inhale. Lower your torso as far forward as you can go without touching the floor with any part of your body. Make sure to keep your back and arms straight throughout the movement. On an exhale, pull the ab roller back to starting position. This is an advanced movement and doing it wrong can also lead to injury. For instance, extending too far or too soon can result in an injured shoulder or rotator cuff. Instead, beginners can use begin with a variation involving the use of a stability ball to stabilize the elbows. Ab wheel exercises how many reps: Perform up to 15 reps for one or two sets. If you are not excessively tired, you can go up to three sets of the same. Start by placing your knees hip width apart with your hands on the Ab wheel roller handles. Make sure to tighten your core so that the lower back is not arched. Then, roll out the wheel as far as possible. The best scenario is that you roll out forward until your chest touches the ground and the arms are fully extended. You then roll the wheel beneath your body and return to the starting position. This move is very hard on the abs. Beginners can start off with smaller motions and work up to a larger range of movement gradually. Ab wheel exercises how many reps: Begin with three sets of six to eight reps. You can increase your reps by two each week. This workout builds on the kneeling ab wheel roll out and takes it to a higher difficulty level. You start off on your toes in a sort of push up position. Place the ab wheel beneath your shoulders and roll it out forward slowly, before rolling it back to starting position. This move is extremely difficult, so be patient if it takes you a while to do it correctly. Ab wheel exercises how many reps: It is important to build up slowly to this exercise. You can begin with two or three sets of five reps.
To target the core, you will typically roll out the ab roller directly forward. However, working out your obliques will involve rolling it in a more diagonal path. You start out in the standard rollout starting position. You then turn the ab roller at a 45-degree angle and twist your body in that direction while rolling it forward. This increases the activity of your obliques and works them out more. Ab wheel exercises how many reps: Start out with a set of 15 reps on each side. You can increase this number gradually till you can do ten reps each week. There are a lot of ab roller brands available on the market today. And, just like any other product, there are both good and bad brands being sold currently. So, how do you determine which is the perfect ab roller to buy? Through scoring online marketplaces and communities, we have come up with five of the best devices for your consideration. One of these will definitely be the best ab wheel for you. The Perfect Fitness Pro is one of the best ab wheels on the market today. A Navy Seal was looking for a more effective way for soldiers to train and ended up designing this device. This ab roller is unique in that it uses a carbon steel spring to provide both kinetic energy and resistance once you roll it out. It also provides you with assistance when it is time to roll it back in. Using a wider track than typical ab wheels which improves the balance significantly. The track is also angled slightly, which allows for greater engagement of both internal and external obliques. This makes it very successful at carving the abs. Its handles are also angled downward. This gives you more control and engagement. It also allows you to work out your triceps without putting too much strain on the shoulders. Using a heavy duty spring which provides both resistance and kinetic energy. The Perfect Fitness Ab Carver Pro incorporates an innovation and attention to detail that makes it highly unique and effective. Its sleek and stylish design simply adds to its value as a quality product. The heavy duty carbon spring adds resistance that makes your workouts more challenging but effective. This helps carves out stronger time in a shorter period. It's wider tread also gives you greater stability while rolling out the wheel. This is especially important during angled workouts that target obliques. Purchasing this ab roller gives you access to free downloads that give you a full range of workouts at different levels of advancement. You also get thick, high-quality styrofoam knee pads. This helps to protect the knees when you are working out on hard surfaces. If you weigh over 200 pounds, you may find that the handles bend a little. This ab roller has a feature that locks it to protect you from rolling too far. However, some users have said that this limits their range of motion. This roller uses a carbon spring to help you roll back up. However, some users view this as cheating. This ab roller is one of the newer products on the market. It incorporates some distinctive features into its design that you will not find on other rollers. This device utilizes two wheels, instead of the usual one. This helps it provide you with more resistance and greater balance. They also use straps, which works out your whole body by letting you move through your workout in many different angles. This ab roller handles are super deluxe and comfort, allowing you to use the device for longer without developing calluses. It is a great workout tool for the frontal abdominal muscles. Furthermore, each purchase of the Ab Wow Abdominal Roller comes with handlebars, straps, wheels, a knee pad, workout poster, and instruction guide. This high-quality product can be fit together seamlessly in less than a minute. This ab roller provides you with a greater range of motion to work out many different parts of the body. It uses a dual wheel design which makes it sturdier and more versatile. High-quality PVC materials are used in its construction to make this ab roller more durable. It uses a large, 8-inch wheel to provide more stability and a reliable turn. Its handles are thick, well-padded and very comfortable. This means that it will not hurt your hands as you continually rest your body weight on it. It allows you to change the angle of resistance, letting you work all the muscles in your lower and mid-back regions, as well as in the abdominal wall. This means your workouts will be more effective. This ab roller cannot target the intercostal muscles. This is the only ab roller to use a patented, three-wheel design. Its resultant triangular design allows the VIM Ab Roller Wheel to provide you with greater stability and balance when in motion. This feature makes this the best ab wheel for beginners. It also uses an independent floor stop wedge that lets you stop rolling out at the perfect extension and contraction for you. Furthermore, every package of the Vim Ab Roller Wheel includes knee pads to give you greater comfort while working out. Its unique, patented design enhances both stability and balance. The handle grips are very comfortable, making this ab roller suitable for extended use. Comes with a floor stop wedge that gives you greater control over your workout. This ab roller is constructed out of high-quality materials to improve its durability. Its knee pads are not designed for larger people. 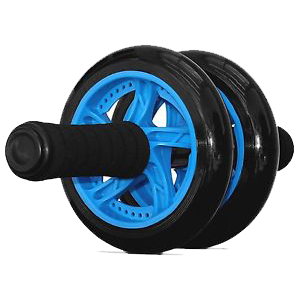 This is another popular ab wheel that uses a dual-wheel design. It is not quite as sturdy as the other options; neither is its size as large. However, the Maximiza Ab Wheel is still one of the most reliable and effective products on the market. This roller incorporates a design that cuts down and prevents wobbling, making it very stable. It is also suitable for users at all levels, from beginners to the more experienced. It is an especially great choice for anyone just starting ab roller workouts, because of the stability and balance it provides. Uses a double wheel design that enhances your stability and balance. Each package comes with a high-quality, padded knee pad. It also has high grip handles that lets you work out without placing undue strain on your body. It is durable but still lightweight enough to ensure easy transportation and portability. It is not as sturdy as other similar ab rollers. The Ab Roller Pro is a frame that supports your head, arms and upper body as you perform abdominal workouts like sit-ups and crunches. It helps you perform these critical exercises without losing proper form. Despite the fact that it is not an ab roller, this device is usually included in many ab carver reviews. This is because it helps you effectively work out abs and obliques. This device is sturdy, durable, and can be assembled easily. It uses an ergonomic design that helps you hold perfect form while working out your abs. It easily Isolates and targets the abdominals during workouts. It is both durable and lightweight. It is not designed to fold for easy storage. If your goal is to rapidly lose weight or reduce body fat, then the ab roller is not for you. This is because only a good diet and cardio can help you do so. However, these devices can help you in other ways. The main ab wheel benefits include tightening and strengthening your core and abs. And, if you choose the right ab wheel, they can also work out your arms, shoulders, and back. Furthermore, their effectiveness cannot be questioned. In a recent study, the American Council on Exercise determined that ab rollers were among the top exercises in terms of how much they engaged and targeted abdominal muscles. Thus, coupling ab roller exercises with regular cardio and a healthy diet will help you get spectacular abs in no time.